London Local plumbers combi boiler. Engineers Maida Vale and Notting Hill Cricklewood. Combi Boiler Installation Engineers gineers in London areas. Central Heating installations In Ladbroke Grove. Central Heating repairs in Westminister. 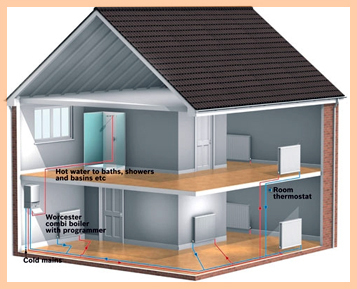 Central Heating Services in W1 London. Gas Safe Engineers Experts in Boiler Breakdowns. At a time that its needed most a central heating gas boiler can breakdown whether in winter or summer we advice getting your combi boiler service by a gas safe registered Boiler Engineer at least once a year you can always arrange this at the same time as your annual Landlord gas certification where it will work out cheaper having both done in one. A boiler service can help prolong the life of your boiler while servicing your combi boiler it's good to have your central heating system check, this could help to spot any sludge build up in the central heating system which if treated early can avoid damaging vital parts in the boiler such as the heat exchanger and pump. Sized pump possibly sludge or rust. Faulty Fan possible windings worm out or dirty. Faulty thermistor giving wrong reading of temperature. Faulty Diverter Valve broken Diaphragm. Pressure Relief Valve leaks due to condition of system water. Damaged printed Circuit Board (pcb) water damage or relay burnt out. How effient is my boiler does it work correctly in occurdance with energy efficiency try our free combustion analysis with print out showing working performance of your boiler efficiency. Combustion Products Analysis with print out. Gas Pipe work tightness testing. Refill Central heating system with chemicals Inhibitor. Boiler supplying with pay monthly plan. Contact us on 0208 278 7344 for more details.